Yogurt drink with L.Casei Danone cultures, vitamins B6, D, baobab, mango, turmeric, acerola and pimento. Dash of chilli. No added sugar - contains naturally occurring sugars. 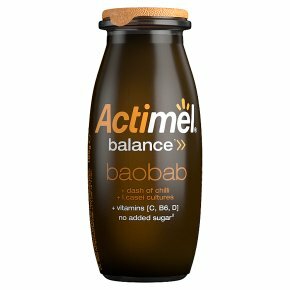 Balance1 Baobab is the African tree that can live for up to a thousand years, which we carefully blend with delicious yogurt containing billions of L.Casei cultures. We also add 1vitamin C which contributes to the protection of cells against oxidative stress. A shot of smooth and zesty flavours, plus a dash of chilli to tingle your taste buds.